Periodic market declines are a normal part of investing, but can seem frightening when they do happen. During those times it is easy to become shortsighted which can lead to bad decision making. History has shown that volatility tends to fade over time. Moreover, one of the best ways to adjust portfolio volatility is by choosing a mix of assets that best suits you. We believe companies with a history of increasing dividends provide a good starting place in a search for fundamentally strong and growing companies. Importantly, steady dividend growth often follows consistent profitability and shareholder-focused management. 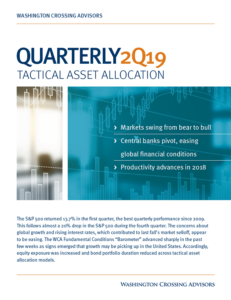 A dividend growth perspective looks beyond today’s yield and considers other factors, such as quality, growth, risk, and value. 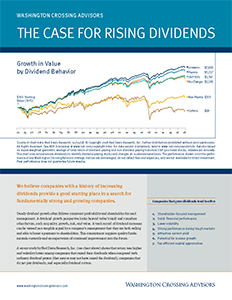 A track record of dividend increases can be viewed as a tangible signal by a company’s management that they are both willing and able to boost a payment to shareholders. This commitment suggests quality fundamentals currently and an expectation of continued improvement into the future.